The HS-125-700 and Hawker 800 are two more recent versions of the world's longest running corporate jet production program.The 125-700 and Hawker 800 are direct developments of the DH-125 (later the HS-125), which first flew in August 1962. This aircraft was developed into a number of variants through to the HS-125-600, all of which are powered by the RollsRoyce Viper turbojet and are described separately under Hawker Siddeley.The 125-800 became the Hawker 800 from mid 1993 when Raytheon purchased BAe's Corporate Jets division. Production has been transferred to Wichita in the USA (the first US built 800 flew on November 5 1996, the last UK built 800 on April 29 1997). Current production is of the 850XP (Extended Performance) which was certificated in 1995 and has improved engines for better climb and cruise performance. A new interior is being introduced in 1999. 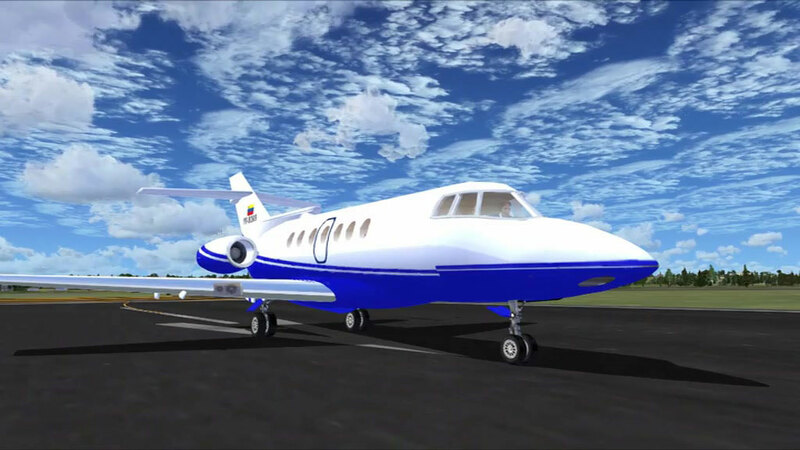 Includes dynamic virtual cockpit, animated co-pilot and more. Model & textures by Alejandro Rojas Lucena ("alrot" in the forums). The archive HS125FSX.zip has 186 files and directories contained within it. Although the first equivalent of this aircraft – the DH-125/HS-125 – flew more than 50 years ago, the legacy that was left behind was without a doubt one of the most impressive in commercial jet history. I’ve spent a lot of my flight simulation time flying business jets and the like, so when I came across this package it felt like something I absolutely had to try. It makes a big difference, to me, if you are able to hop into the cockpit of an aircraft and feel as if you are flying something fresh and unique and although you can see where the commercial jet legacy started to change with this aircraft, it’s unique enough to offer a different flight perspective from many other commercial jets. For those who enjoy something a bit more dynamic than usual, and want to be able to undertake something with a bit more class and precision to it, I would heartily recommend this. The detail in the design of the jet itself is pretty immaculate, but it’s more the little things that come to play. The virtual cockpit has been created in the most stunning fashion, detailing all of the little features that you would be spotting inside an aircraft like this. More importantly, tough, the aircraft itself carries all of the old-school hallmarks of an aircraft like this so that you will have only the features that real-life pilots would have had available to them. For the realistic, this can really change everything. The most important thing to remember, however, is that a commercial jet can feel massively different from one package to the next. I instantly noticed the difference between this and more “modern” equivalents such as a difference in the overall power and the features inside the cockpit. What was different, though, for the positive side of things was the attention to detail. Think the original aircraft in FSX are impressive? Then the attention to detail and overall commitment to design here is going to be one of the most amazing things that you are likely to see anytime soon. The engines offers steady and strong climbing performance as well as ensuring that you can cruise with relative freedom. This makes it easy for pilots who are still learning their way around the commercial jet world to fly a bit higher than usual and make a real difference to the way that they fly in the first place. It’s the kind of aircraft that you need to adapt to, but it will be something that you can plan and prepare with. The detail and the overall structure make it incredibly easy to control and manage your aircraft along the way, with all of the main functions and requirements need laid out in the most obvious way possible. This makes flight even simpler to control than ever before, and will ensure that you get a comfortable and safe flying experience when using this brilliant mod – I recommend it for any commercial jet fans out there. For some reason, the landing and taxi lights are black. Anybody have a fix? So I downloaded the files and started up FSX and it shows the airplane but in the preview you can only see the model (no colours or stuff). The same is also if I start it on Free Flight no colours. I think that it is the texture that doesn't work. I'm new to FSX (downloads) so please help! Very nice modeling. Great flight dynamics. It's... ok. It doesn't have any impressive features, but after all it is freeware. It probably isn't something I would rush to download, but it is worth being free. This is an unbeleiveable plane to dowload. 5 great planes, and there is a COPILOT that you can see, and on a few other FSX planes, you can't even see you! I'd pay about $15 for this one.